Today I have a very simple card for you. I got some most of the materials - papers, bling and flower i used on the card here from my lovely friend Kelly during our Christmas swap. I just printed a free digi image and colored her and assembled the card after adding just the ribbon. Love all the fun pattern paper and that flower is so cute. Thank you Kelly. Have a lovely crafty weekend. Oh wow Pam this is just packed with gorgeousness. So love your colouring and that decorative frame around the image, which look kind of neatly torn. Gorgeous ! Stunning!! WOW !!!! Tomorrow is NATIONAL SCRAPBOOK DAY so we going to have some fun and craft all day!! 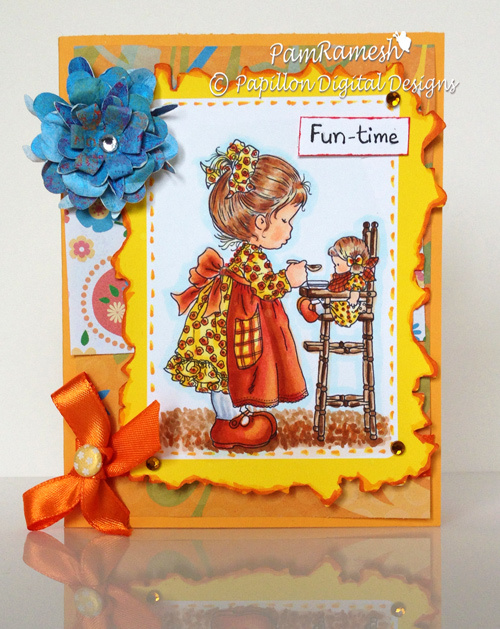 If you get a chance to get in your craft room tomorrow I will be hosting 4 different challenges at Clearly iStamp Blog. I would love if you can come play with me and you might even win some great prizes! Oh this card is soooo pretty Pam! I love the color combo together too! Nicely done!